The new Yamaha XV1900 Midnight Star is arriving in showrooms following its appearance at the BMF Show last weekend. 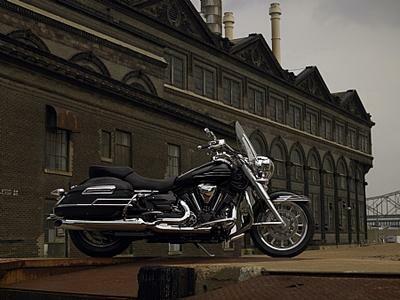 The latest addition to the Star range produces 168Nm torque at just 2500rpm, and is inspired by the US Custom scene. It has a long and low aluminium frame for feet-forward cruising, with acres of polished chrome and all black bodywork. Find cruisers for sale. Click here. MCN and user cruiser reviews. Click here. Find the perfect riding kit for cruiser riders. Click here. The Yamaha XV1900 Midnight Star tops the Yamaha cruiser range. It's available in Midnight Black, and costs £9999. Contact: 01932-358121.